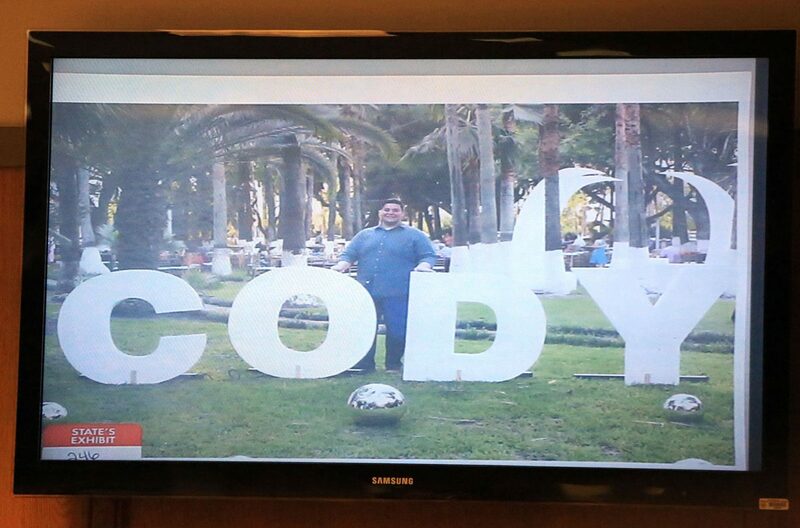 A photo of Monica Melissa Patterson's son at the high school graduation celebration she threw for him in summer 2015 is displayed as evidence during her capital murder trial Wednesday, October 11, 2017 in the 370th state District Court at the Hidalgo County Courthouse in Edinburg. EDINBURG — Those curious about whether Monica Melissa Patterson will take the stand in her capital murder case will for now have to settle for the picture prosecutors are painting of the defendant. Assistant criminal district attorneys trying the case have accused Patterson, the former Comfort House administrator who’s on trial for the January 2015 murder of 96-year-old Martin Knell Sr., of engaging in extravagant spending habits that included throwing a $20,000 high school graduation party for her son. As the trial neared the end of its third week Thursday, jurors heard even more from witnesses who testified about their role in helping Patterson throw this party, which prosecutor Joseph Orendain has described as a “lavish” event thrown on the McAllen hospice’s dime. This comes on the heels of Wednesday’s testimony from the event planner himself, who said he received $2,500 from Patterson for coordinating the party, which attracted as many as 300 people. 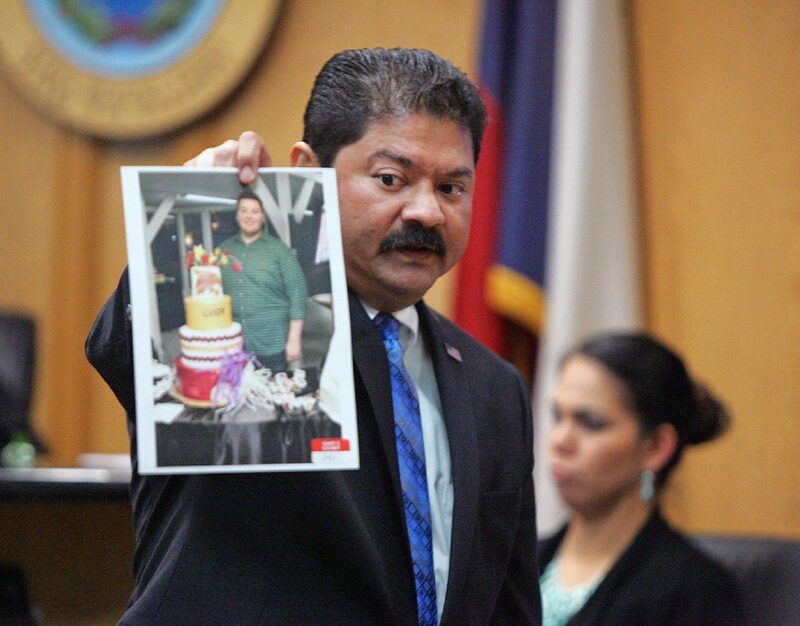 Prosecuting attorney Joseph Orendain holds a photo of Monica Melissa Patterson's son standing next to a cake at his high school graduation party during her capital murder trial Wednesday, October 4, 2017 in the 370th state District Court at the Hidalgo County Courthouse in Edinburg. Jurors have previously seen photos of the event, including a three-tier cake, lighted dance floor and the venue’s lawn, with Patterson’s son’s name spelled out in giant letters. On Thursday, the owner of the venue where the party was held testified she was paid $4,500; the owner of a lighting and audio company said she received approximately $1,600 for her services; and the manager of a valet company confirmed that she charged Patterson nearly $1,600 for the 12 employees who worked the event. All received checks from Comfort House signed by Patterson. However the costs of other party-related expenses — such as the catering and DJ — have not been revealed to jurors. It was revealed to jurors this week that the defendant, who accepted the Comfort House administrator job on a salary that was in the vicinity of $40,000, often picked up the tab when dining with friends, co-workers and high school classmates. Another witness testified Thursday that Patterson paid his company $360 to rent a limousine for her son’s prom, a payment jurors first saw on a Falcon International Bank statement listing unauthorized company expenses Patterson had charged to Comfort House. That statement was once again in question Thursday when prosecutors called Melissa Gonzalez, a certified public accountant, back to the stand. The firm where Gonzalez is a partner audited Comfort House in 2014 per Patterson’s request. The person who Orendain said “supposedly prepared” the minutes was Melissa Chavez, an administrative liaison/finance assistant at Comfort House. But Chavez previously testified that she did not recall preparing these minutes, and that her signature was missing her middle initial, which she often includes. Statements from the bank in question, Falcon International, were not included in the documents Patterson provided to Gonzalez’s firm. “It struck me as odd that those minutes stated that they were authorizing a bank account that I (did not find) when I did my audit,” Gonzalez said, explaining that she reviewed the “audit evidence” after her testimony. Such evidence included the documents the firm had saved related to the Comfort House audit, Gonzalez added. This, she asserted, is why Gonzalez’s firm had no knowledge of the Falcon account. After confirming this discrepancy, Gonzalez contacted the District Attorney’s office and provided them with the minutes Patterson had given her. Defense attorney Ricardo “Rick” Salinas said Gonzalez could have discovered this account, or any account “erroneously” left out, had she requested a power of attorney from Comfort House. The document would have enabled her to look up the financial accounts tied to the hospice. “Obviously if you had done your work in your audit … you would have picked up the fact that that account had been reported to the IRS,” Salinas said. When pressed on why she hadn’t requested a power of attorney from Comfort House, Gonzalez said making such a request isn’t a common audit procedure. Gonzalez added “there was no reason to” as she only requests the document when “representing someone with IRS matters dealing with their tax return or payroll” — neither of which applied in the Comfort House audit. Jurors have yet to hear from the defense to provide its insight into Patterson as prosecutors continue calling witnesses to the stand as they build their case against the defendant.